FEB 5, 2019 CHICAGO — More than one-quarter of physicians surveyed, about 28 percent, report the prior authorization process required by health insurers for certain drugs, tests and treatments have led to serious or life-threatening events for their patients, according to new survey results released by the American Medical Association. The Medical Association recently received information from a consortium of health care providers, which included the American Hospital Association, America’s Health Insurance Plans, the American Medical Association, the American Public Health Association, Blue Cross Blue Shield Association and the Medical Group Management Association, who have partnered to identify opportunities to improve the prior authorization process. The Board of Censors during its last meeting tasked the Council on Medical Services to further investigate the consortium’s report. The consortium’s goals are to promote safe, timely and affordable access to evidence-based care for patients; enhance efficiency; and reduce administrative burdens. 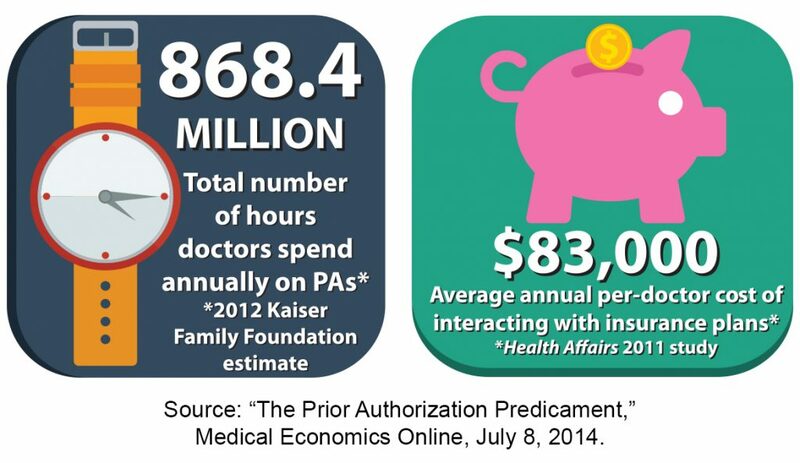 However, according to a 2012 Kaiser Family Foundation estimate, physicians spend 868.4 million hours annually on prior authorizations. In a 2011 study by Health Affairs, the average annual per-doctor cost of interacting with insurance plans to complete prior authorizations was about $83,000. Once the Council on Medical Services concludes its investigation, more information will be available. Read the Consensus Statement on Improving the Prior Authorization Process from the consortium. Responding to unreasonable hurdles for patients seeking care, the Medical Association has joined a coalition including the American Medical Association and 16 other health care organizations urging health plans, benefit managers and others to reform prior authorization requirements imposed on medical tests, procedures, devices and drugs. The coalition, which represents hospitals, medical groups, patients, pharmacists and physicians, says that requiring pre-approval by insurers before patients can get certain drugs or treatments can delay or interrupt medical services, divert significant resources from patient care and complicate medical decisions. Concerns that aggressive prior authorization programs place cost savings ahead of optimal care have led Delaware, Ohio and Virginia to recently join other states in passing strong patient protection legislation. The data entry and administrative tasks associated with prior authorization reduce time available for patients. According to a new AMA survey, every week a medical practice completes an average of 37 prior authorization requirements per physician, which takes a physician and their staff an average of 16 hours, or the equivalent of two business days, to process. Seventy-five percent of surveyed physicians described prior authorization burdens as high or extremely high. More than a third of surveyed physicians reported having staff who work exclusively on prior authorization. Nearly 60 percent of surveyed physicians reported that their practices wait, on average, at least 1 business day for prior authorization decisions —and more than 25 percent of physicians said they wait 3 business days or longer. Nearly 90 percent of surveyed physicians reported that prior authorization sometimes, often, or always delays access to care. The AMA survey findings indicate there is a real opportunity to improve the patient experience while significantly reducing administrative burdens for both payers and physicians by reforming prior authorization and utilization management programs. The Medical Association has joined a coalition of physicians’ groups, hospitals, medical groups, pharmacists and other health care organizations to urge health plans, benefit managers and other groups to reform prior authorization requirements imposed on medical tests, procedures, devices and medications. The coalition is responding to what has been deemed unreasonable hurdles for patients seeking care and argue that requiring pre-approval by insurers before certain treatments can delay or interrupt medical services, divert significant resources from patient care and complicate medical decisions. Nearly 60 percent of surveyed physicians reported that their practices wait, on average, at least one business day for prior authorization decisions—and more than 25 percent of physicians said they wait 3 business days or longer. For specialists like Montgomery oncologist Stephen Davidson, M.D., at the Montgomery Cancer Center, issues with PAs can begin when the patient checks in for the first appointment. Read more about what Dr. Davidson and Lee Carter, M.D., of Autaugaville had to say about PAs in our article from Alabama Medicine magazine, Between Doctors & Physicians: Prior Authorizations.